Added a 5 point face landmarking model that is over 10x smaller than the 68 point model, runs faster, and works with both HOG and CNN generated face detections. My goal here today is to introduce you to the new dlib facial landmark detector which is faster (by 8-10%), more efficient, and smaller (by a factor of 10x) than the original version. To learn more about facial landmark detection with dlib, just keep reading. In the first part of this blog post we’ll discuss dlib’s new, faster, smaller 5-point facial landmark detector and compare it to the original 68-point facial landmark detector that was distributed with the the library. From there we’ll implement facial landmark detection using Python, dlib, and OpenCV, followed by running it and viewing the results. Finally, we’ll discuss some of the limitations of using a 5-point facial landmark detector and highlight some of the scenarios in which you should be using the 68-point facial landmark detector of the 5-point version. Figure 1: A comparison of the dlib 68-point facial landmarks (top) and the 5-point facial landmarks (bottom). Figure 1 above visualizes the difference between dlib’s new 5-point facial landmark detector versus the original 68-point detector. The most appropriate use case for the 5-point facial landmark detector is face alignment. In terms of speedup, I found the new 5-point detector to be 8-10% faster than the original version, but the real win here is model size: 9.2MB versus 99.7MB, respectively (over 10x smaller). It’s also important to note that facial landmark detectors tend to be very fast to begin with (especially if they are implemented correctly, as they are in dlib). You’ll recall that we used the more accurate HOG + Linear SVM face detector for the laptop/desktop implementation, but required a less accurate but faster Haar cascade to achieve real-time speed on the Raspberry Pi. Haar cascades: Fast, but less accurate. Can be a pain to tune parameters. HOG + Linear SVM: Typically (significantly) more accurate than Haar cascades with less false positives. Normally less parameters to tune at test time. Can be slow compared to Haar cascades. Deep learning-based detectors: Significantly more accurate and robust than Haar cascades and HOG + Linear SVM when trained correctly. Can be very slow depending on depth and complexity of model. Can be sped up by performing inference on GPU (you can see an OpenCV deep learning face detector in this post). Keep these guidelines in mind when building your own applications that leverage both face detection and facial landmarks. Now that we have discussed dlib’s 5-point facial landmark detector, let’s write some code to demonstrate and see it in action. On Lines 2-8 we import necessary packages, notably dlib and two modules from imutils . Again, updating imutils will allow you to work with both 68-point and 5-point facial landmarks. We have one command line argument: --shape-predictor . This argument allows us to change the path to the facial landmark predictor that will be loaded at runtime. Note: Confused about command line arguments? Be sure to check out my recent post where command line arguments are covered in depth. On Lines 19 and 20, we initialize dlib’s pre-trained HOG + Linear SVM face detector and load the shape_predictor file. In order to access the camera, we’ll be using the VideoStream class from imutils. First, we read a frame from the video stream, resize it, and convert to grayscale (Lines 34-36). Then let’s use our HOG + Linear SVM detector to detect faces in the grayscale image (Line 39). From there, we draw the total number of faces in the image on the original frame by first making sure that at least one face was detected (Lines 43-46). Beginning on Line 49, we loop over the faces in rects . We draw the face bounding box on the original frame (Lines 52-54), by using our face_utils module from imutils (which you can read more about here). Then we pass the face to predictor to determine the facial landmarks (Line 59) and subsequently we convert the facial landmark coordinates to a NumPy array. Now here’s the fun part. To visualize the landmarks, we’re going to draw tiny dots using cv2.circle and number each of the coordinates. On Line 64, we loop over the landmark coordinates. Then we draw a small filled-in circle as well as the landmark number on the original frame . In this block, we display the frame (Line 70), break out of the loop if “q” is pressed (Lines 71-75), and perform cleanup (Lines 78 and 79). Now that we have implemented our facial landmark detector, let’s test it out. Be sure to scroll down to the “Downloads” section of this blog post to download the source code and 5-point facial landmark detector. Figure 2: The dlib 5-point facial landmark detector in action. Is dlib’s 5-point or 68-point facial landmark detector faster? In my own tests I found that dlib’s 5-point facial landmark detector is 8-10% faster than the original 68-point facial landmark detector. A 8-10% speed up is significant; however, what’s more important here is the size of the model. The original 68-point facial landmark is nearly 100MB, weighing in at 99.7MB. The 5-point facial landmark detector is under 10MB, at only 9.2MB — this is over a 10x smaller model! When you’re building your own applications that utilize facial landmarks, you now have a substantially smaller model file to distribute with the rest of your app. A smaller model size is nothing to scoff at either — just think of the reduced download time/resources for mobile app users! Figure 3: Face alignment applied to obtain a canonical rotation of an input face. While the 68-point facial landmark detector may give us slightly better approximation to the eye centers, in practice you’ll find that the 5-point facial landmark detector works just as well. All that said, while the 5-point facial landmark detector is certainly smaller (9.2MB versus 99.7MB, respectively), it cannot be used in all situations. Figure 4: We make use of dlib to calculate the facial landmarks + Eye Aspect Ratio (EAR) which in turn can alert us for drowsiness. When applying drowsiness detection we need to compute the Eye Aspect Ratio (EAR) which is the ratio of the eye landmark width to the eye landmark height. When using the 68-point facial landmark detector we have six points per eye, enabling us to perform this computation. However, with the 5-point facial landmark detector we only have two points per eye (essentially and from Figure 4 above) — this is not enough enough to compute the eye aspect ratio. …then you’ll want to use the 68-point facial landmark detector instead of the 5-point one. Interested in learning from Davis King, author of dlib and CV/ML expert? If you’re interested in learning from Davis King and other computer vision + deep learning experts, then look no further than PyImageConf, PyImageSearch’s very own practical, hands-on computer vision and deep learning conference. At PyImageConf on August 26-28th in San Francisco, CA, you’ll be able to attend talks and workshops by 10+ prominent speakers and workshop hosts, including Davis King, Francois Chollet (AI researcher at Google and author of Keras), Katherine Scott (SimpleCV and PlanetLabs), Agustín Azzinnari + Alan Descoins (Faster R-CNN and object detection experts at TryoLabs), myself, and more! I guarantee you’ll be more than happy with your investment in time and resources attending PyImageConf — the talks and workshops will pay huge dividends on your own computer vision + deep learning projects. To learn more about the conference, you can read the formal announcement here. And from there, you can use the following link to grab your ticket! In today’s blog post we discussed dlib’s new, faster, more compact 5-point facial landmark detector. This 5-point facial landmark detector can be considered a drop-in replacement for the 68-point landmark detector originally distributed with the dlib library. After discussing the differences between the two facial landmark detectors, I then provided an example script of applying the 5-point version to detect the eye and nose region of my face. In my tests, I found the 5-point facial landmark detector to be 8-10% faster than the 68-point version while being 10x smaller. To download the source code + 5-point facial landmark detector used in this post, just enter your email address in the form below — I’ll also be sure to email you when new computer vision tutorials are published here on the PyImageSearch blog. Is there a group or a forum to bounce ideas related to work related to Python visual detectors related to your courses? The PyImageSearch Gurus course includes dedicated forums. Many readers inside the course are interested in and/or actively working with visual detectors. Additionally, the Deep Learning for Computer Vision with Python book includes a private companion site along with issue/bug trackers that readers utilize to converse. For your particular question though, I believe the Gurus course is what you would want. Your last sentence says “…10x faster.” but I think you mean 10x smaller. Thanks, you’re absolutely correct. I have updated the post. Hi, great article! I was wondering is there a way do this with kCVPixelFormatType_420YpCbCr8BiPlanarVideoRange (420v) pixel format type instead of BGRA? I want to try it in my iOS objc live video chat app, which supports only the YUV format type. Could you just convert the frame from YUV to RGB instead? Sorry, I don’t have too much experience with Obj-C and iOS for this. I was wondering if we could use it as head pose estimation in real-time. Technically sure, but it wouldn’t be as accurate. A good head pose estimation should consider the “boundary points” of the face, including outer corners of the eyes, mouth, and bottom of the chin. Keep in mind that the 5-point model gives only the eyes and nose. You would thus be estimating the pose with only 3 points (outer eye coordinates and nose). thanks for the interesting point. 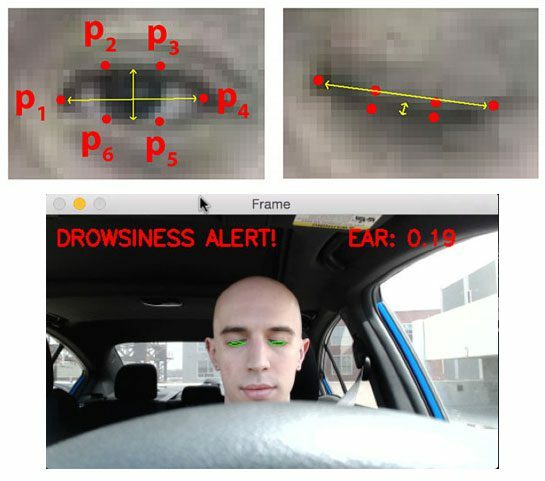 Regarding drowsiness detection, the current 68-point model is not accurate when the head is turned or using glasses or using IR camera. Do you have any suggestion on this? I have tried other face detection algorithms using deep learning methods which resulted in a better and faster face detection. However, when it comes to facial landmark detection still, I am lacking accuracy and speed. I have implemented your code in Raspberry pi resulting in a slow and erroneous performance. Computer vision and deep learning models are not magic. If a head is too far rotated or the eyes not visible, you won’t be able to detect the face and compute the facial landmarks. Drowsiness is more than just vision-based, it can also be determined by other sensors, such as breathing, blood flow, etc. A drowsiness detector should involve multiple sensors, not just vision. Vision is one component of many that should be used. If you want to continue to use a vision-based approach, you can, but you’ll want to train some machine learning models to detect drowsiness from movements of the head, such as head bobs, tilting, etc. However, the Raspberry Pi will likely not be fast enough for this. Again, this is where multiple sensors would be useful. what sensors can you guide me? As I mentioned, you could use sensors to detect blood pressure, oxygen levels, heart beats per minute, etc. Make sure you do your research on sensors to measure biological data. Hi Adrian, thanks for the interesting material. I would like to ask something that may be a bit out of context. The packages involved here are pretty much complicated, in relation to versioning and installation requirements. If you can, please add a chapter on which packages to install and how to install them. I know there are multiple ways to install these packages,however if you could publish your method, then it would prove useful for many of us and shorten the time of practice. Many thanks to your true efforts. Which packages are you referring to? OpenCV is the main one that’s a bit of a pain to install. Dlib is now pretty straightforward to install. See my latest post on installing dlib. I don’t have any plans to add install tutorials to any of my books as I link to install instructions (on the PyImageSearch blog) from them. The main reason I do this is to ensure I can keep all install instructions up to date and release new install instructions when they change dramatically. Trying to keep install instructions in the book itself would lead to them being out of date and running into issues. The frame i get from the streamer is None. It sounds like OpenCV cannot access your camera. Are you using a USB webcam or Raspberry Pi camera module? I would suggest you take a look at this post to help diagnose further. I’m working with a great face_recognition system, and the process is face detect, 5 points alignment, then face recognition. But I find that the 5 points it wants is one point on the middle for each eye, one point for nose, and two points for the mouth on the left side and right side. So it’s different from the 5 point you demonstrated in this article, so I want to ask can this module output the 5 points I want? Traditional face alignment is done using the eye centers and the midpoint of the eyes. Calculate those values and you should be able to perform face alignment. I’m not sure what you mean by the “value” in this context. The model is applied to the detected face and the returned “values” are the (x, y)-coordinates for each predicted facial landmark. ])” (from 68 point facial landmark detection in helpers.py file ) to find the Center of right eye and left eye for facealignment using Dlib’s 5-point facial landmark detector. You can compute the center of both eyes by computing the mid-point between the two respective coordinates for each eye. Keep in mind that with the 5-point model there are only two coordinates per eye. Thank you Adrian but i want to know that, how can i access those “two respective coordinates for each eye” from shape array to find the mid-points? Take a look at the GIF at the top of this blog post (you can see the index of each facial landmark). Additionally, Lines 64-67 demonstrate how we loop over each of the facial landmarks and extract the (x, y)-coordinates. The right eye has indexes 0 and 1 while the left eye has indexes 3 and 4 (although the GIF is a mirror so they may be reversed; you’ll want to double-check for yourself). Hello Adrian, first of all thank you for the awesome blog post. Can you please tell this dlib’s new 5-point facial landmark detector is trained on with dataset as the 68 point model was trained for iBUG 300-W dataset. The 5-point facial landmark model was trained on ~7,100 images that Davis King manually labeled. See this blog post for more details. I want to control WS2812 addresable led, but “Make sure to run the script as root by using the sudo command. The rpi_ws281x library has to access the Pi hardware at a low level and requires running as root”. How I can control my leds from non-admin python script? Which Python libraries are you using to control the LED? I assume GPIO? this dlib tracker seems good because i am not seeing it lost the face frequently. When i use kalman trackers it lost the object frequently (it track it , again lost it , again track it…….) s thank you for your time. Question: which tracker among others do you think that do not lost most frequently the object once it tracked (irrespective of occlusion)? It’s hard to say because each tracker has their respective use cases. It’s highly dependent on your application and what you are trying to accomplish. 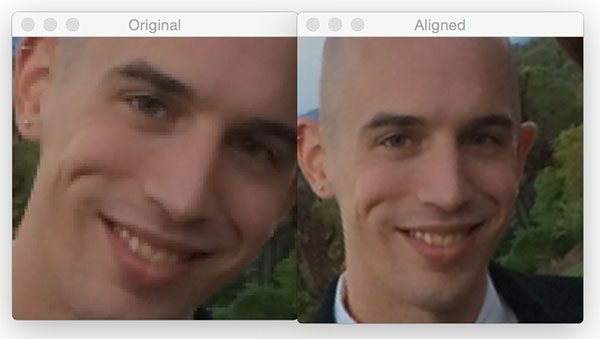 I wonder why are we not passing cropped image instead of the full image for facial landmark extraction. We are giving image and bounding boxes for the faces but we get facial landmarks out side the bounding box in case of 68 point landmarks, I thought we only look inside the bounding box for landmarks, will you please share your thoughts ,Thank you . You should check Line 59 again. We pass the image + bounding box coordinates into the shape predictor. From there dlib uses the bounding box information to perform facial landmark localization only inside the bounding box region. A query, how can I do to train my own database to find points of my interest. The dlib docs can be used to train your own shape predictor. Thanks for publishing such niche tutorials. Everywhere I can read that while going for face recognition , we convert the face features into 128D vector space. I know about the 68 landmarks detection points as explained by you also in Facial landmarks Post. What what are there 128D vector space features, what all calculations are done to convert a face into 128D vector space. I want to know the list of features being used and clauclated a s apart of 128D vector space conversion. I think you may be confusing facial landmark detection and face embeddings, typically used by deep learning algorithms for facial recognition. The 128D feature vector you are referring to was likely generated by a deep learning algorithm used for facial embeddings. Hi Adrian thanks for you great tutorial. how does dilb get 128-D vector, can you give any ideas or reference? Hi. can this project be used for facial emotion detection?? I would recommend training a Convolutional Neural Network for emotion recognition. You can find an emotion recognition implementation inside my book, Deep Learning for Computer Vision with Python. Hi Adrian, I am reading your book Deep Learning for CV. Where in the book is “emotion recognition implementation” as you state directly above? I am just finishing up the starter bundle moving in the practitioner bundle 🙂 Thanks! Hey Ben! Thanks for picking up a copy of Deep Learning for Computer Vision with Python, I hope you are enjoying it so far. The emotion recognition implementation you are referring to is actually in the ImageNet Bundle. I checked the database before replying to your comment and see that you have the Practitioner Bundle. Shoot me an email if you would like to upgrade and I can get that taken care of for you. Hi Adrian, yes great book so far… Im learning alot 🙂 Would the emotion recognition implementation you mention in the ImageNet bundle be something that could run on CPU? Would it be something similar to the smile recognition (Chapter 22 of starter bundle) case study where the algorithm can be ran in real time with using the haar_cascade to find facial ROI? Thanks, for your response… I’m definitely interested in the upgrade..
Is the python code provided with the ImageNet bundle meant to be done all on a GPU setup? 1. 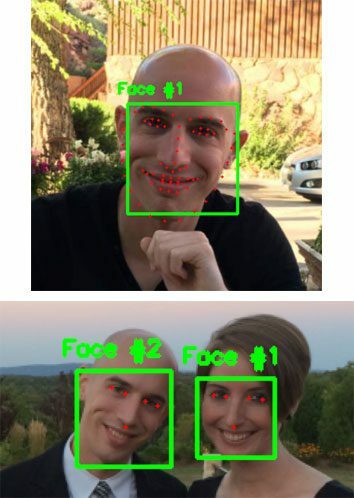 Yes, the implementation is similar to the smile detection case study in the Starter Bundle. 2. Yes, the network can run in real-time on a CPU. It does not require a GPU. For starters, I wanted to just try and insert the dlib landmark detection code into the threaded webcam example (after reading the frame, I go through the procedure of converting the frame to grayscale, detecting, etc. ), but this somehow “kills” the multithreaded part of the app. When I run the threaded example without dlib code, I’m getting a reasonable framerate and CPU usage of about 45-46%. However, with landmark detection, framerate drops to probably 2 fps and CPU usage doesn’t go over 25%. Can you maybe point me in a direction to why is this happening? Is it possible that dlib is so slow that it slows down the main thread and makes multithreading pointless? Would it help if I maybe modified the WebcamVideoStream from imutils by running another thread with dlib landmark detection from there? Which method are you using to detect faces in the video stream from the Pi? Haar cascades? HOG + Linear SVM? Are you using OpenCV or dlib to perform the actual face detection process? I’m using dlib’s detector via the get_frontal_face_detector() method, I’ve gotten the feeling that it detects slightly better than using haar cascades with opencv. Do you think I should try something else? I also wanted to share some knowledge with you… Since Pi3 was slow, I thought about getting a single-board computer with slightly more CPU power, so I got an Asus Tinkerboard (1.8ghz rockchip quad core, 2gb ddr3). I installed the default TinkerOS from Asus and this seemed like a big mistake, even simple camera preview with OpenCV was extremely slow with dropped frames (3-5fps, 70% cpu usage), and I was constantly getting “select timeout” on the console. (with USB camera, logitech c270) Tried several versions of TinkerOS and webcams, no change. However, I managed to install Armbian today along with opencv and dlib (using your guide, of course), works great. I’ll do some tests today to see just how much faster it is than the Pi3. Dlib’s HOG + Linear SVM detector is certainly more accurate than a Haar cascade but it will be slower. I believe dlib is also single threaded by default which would explain why only 25% of your processor (1 core of the Pi) is being used. Also, thanks for sharing your experience with the Tinkerboard! I has been worked on dlib with facial landmarks, but I recognize the accuracy not good for some head pose and performance. So I have a question for you: You have a model which build on deep learning? Hey Oanh — thanks for the comment but I’m not sure what you are asking here. Are you asking if I trained this model? Hi Adrian, I was wondering what the license of your trained detectors is. Can I use it in my open-source or even commercial projects? The facial landmark predictor is part of the dlib library. Here is a direct link to their license. I am trying to train a model which works to detect landmarks in open mouth scenario. I have generated data on my own and detected landmarks using DAN approach (it works quite good). Face detection ROI generated using imglab tool provided by dlib. However there are some cases where face bounding box is beyond all the facial landmarks and some cases where facial landmarks are beyond the FD ROI. Should FD ROI tighten to landmarks to get more accuracy? can you plz share you comment on this? Once you have detected the face are you sure you’re applying your landmark predictor to that specific region? It sounds like there may be some sort of bug in your code where the predictor is applied to other areas of the image rather than that specific ROI. Sorry, my question is how accurate face rectangle is with respect to face landmark annotations? do we need to care about face ROI which suppose to cover all the landmarks? I drew all the landmarks and rectangle from ibug data, it looks like there are cases where face ROI is beyond the landmarks and the other way round as well. One more thing, i trained a model with my own custom data (open mouth data with annotations), when i drew all 68 landmarks, it looks good in terms of accuracy. But when i drew only lip landmarks which are from 48 to 67, they are not accurate. I think there is some issue with indexing of landmarks, any clue how to debug this? Thank you for the things you shared in this article and many other articles! My question: How to dib determines (bX, bY, bW, bH), eg haarcascade use haar-like to do it. Are you referring to the underlying algorithm being used? If so, it’s a Histogram of Oriented Gradients (HOG) + Linear SVM object detector. You need to need to supply the command line arguments to the script. If you’re new to command line arguments be sure to read this tutorial. Hi Adrian, Nice article as always 🙂 I really admire your technical abilities !! Can this used for everyone from new born babies to adults ? If not for new born babies, what changes would you suggest to make it work for new born babies ? I don’t see why it wouldn’t work for newborns. Give it a try and see! I tried to print(shape) but it present the indentation error. Make sure you are using the “Downloads” section of the post to download the source code. It sounds like you introduced an indentation error when copying and pasting.